Why should you hire Community Computer Services than going DIY? Doing things on your own is now a trend. In the present times, it is very popular amongst people to find out the solution of a problem with the help of the internet. All you have to do is to search online for information about the problem that you may be having and you will find a list of solutions with videos and steps to follow. In one glance it seems very easy to follow the steps and get rid of the problems. And sometimes, this works well too. But not always! Remember that you are not an expert and every problem isn’t so easy to solve. This becomes more relevant when it comes to laptop and computer repairs. Computers and laptops work on specified languages and codes which are not always easy for a non-tech person to understand. Even a techie may not be able to handle all problems that may crop up. The result would be that they would make themselves puzzled and may even worsen the situation. If you are stuck with a problem in your laptop or computer, it would best that you opt for Community Computer Services, a computer repair company that has been serving people for more than 25 years now. The company is run by a father, and his son who have established themselves as proven experts in computer repairs and services. Being experts in the own domain, they can easily identify the problems that have occurred and find a solution for the same without being vexed. This not only saves you time, but also guarantees that your computer or laptop’s doesn’t condition doesn’t get any worse. Not only that, Community Computer Services has a vast inventory of different computer and laptop parts that may be needed if a particular part/component has stopped working and is beyond repair. That is something that would be very difficult to do on one’s own, especially if you are a layman with little or no knowledge of what goes where. Even if you do, you may not possess the industry-standard equipment or tools needed to carry out the replacement. Moreover, Community Computer Services has always strived towards offering total customer satisfaction. Whether it be a minor troubleshooting or an complicated repair work, they do everything with utmost zeal and passion. They also offer a guarantee of 7 days on the service they provide and spare parts that they use. This guarantee offered by this family-owned business is something that you wouldn’t find at most places, more so if you plan to go DIY. So, it would be wise not to waste time and effort in trying to repair your laptop if it starts acting weird or stops working all together because you may make things worse. Instead, visit Community Computer Services and you will be able to get your favorite laptop up and running within hours without having to go through any hassle. Let the experts do what they do the best. 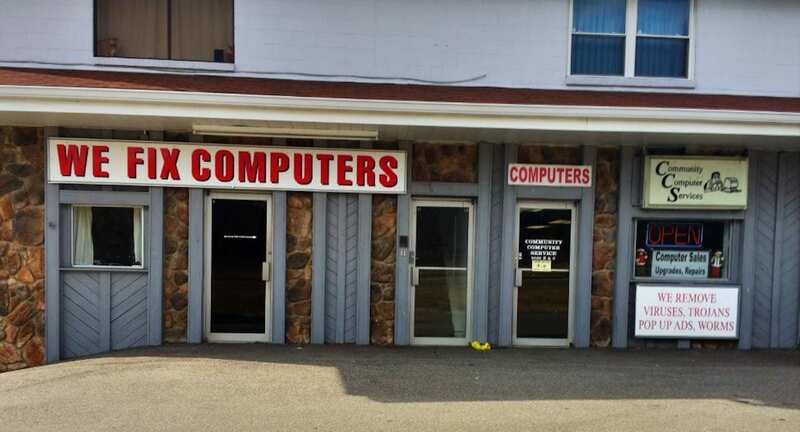 They offer affordable computer repair, laptop repair, virus removal, hard drive repair, and much more in Northern Kentucky. Call them, or stop in their Alexandria Kentucky shop today.